Crocodile Creek beauty and the beast is a 72 piece jigsaw puzzle will delight all ages, particularl..
Crocodile Creek's Dinosaurs 72 piece floor jigsaw puzzle will delight all ages with its whimsical a.. This 100 piece floor puzzle is challenging and fun for kids to learn the different species of insec.. Your child will love this whimsical and vibrant Djeco Garden Party 100 piece Observation Puzzle. Al.. This 96-piece wooden jigsaw will provide fun at any time of day. With cows in the meadow and the fa..
Colour Inside the Tray Aquarium Puzzle features Real 3D photo images that bring farm animals to l.. This 55 piece puzzle beautifully illustrates how pollination spreads via birds and beesIt’s not oft.. Physical map of The World with names of mountain ranges, deserts, plains, rivers, islands, o.. Manufactured from high quality board, this 70 piece puzzle is an excellent representation of our so.. Puzzles Size: 46 x 36 cm consists of 63 elements Pack size: 16 x 13 cm, with rope handles.P..
With the Solar System Puzzle from Mudpuppy, children can learn about our solar system with puzzle p.. 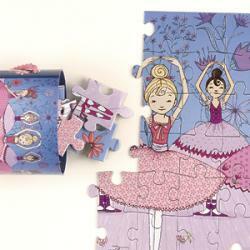 Beautifully illustrated puzzle with a highly-detailed princess scene!Place the puzzle pieces in the.. This impressive map includes exciting pictorial illustrations of the world's landmarks, major citie.. Explore outer space with this beautifully illustrated Map of the Solar System. This education.. Discover your favourite sea creatures and explore the ocean floor in this educational and interacti.. ABC...This colourful set of 26 ABC puzzle cards provides children with an excellent introduction to .. The Match It! Series features a wide range of award-winning educational titles.Each product in .. This clever and colourful 72 piece wooden puzzle introduces pre-schoolers to geometry through shape..
Join our VIP email club and receive 15% off your first purchase. Copyright © 2016, Little Minds Ltd, All Rights Reserved.